Aspirations « Mike Henry Sr.
We’ve gotten rid of our land line. So I don’t get to use that question often any more. You see, when we would get those spam calls at dinner telling us “You can save money on our credit cards. Press 1 to learn more.” I always pressed 1. I waited until I got a person and then I asked them their name. Once they gave me their name, I always asked the question above. I figured if I could eliminate the supply of people who are willing to do that kind of work, it might keep some of us from getting called. Today, I’d like to send that question to the employee at LinkedIn who dreamed up this scheme. I received this email from LinkedIn Notifications. I believe this is a legitimate email from a legitimate business. This person’s profile exists on LinkedIn and he has 1 connection. So someone accepted without checking. This person is not a connection. I don’t know them and in all of my email accounts, I’ve never received or sent an email to this person. I don’t know them. They’re not in my LinkedIn contacts either. 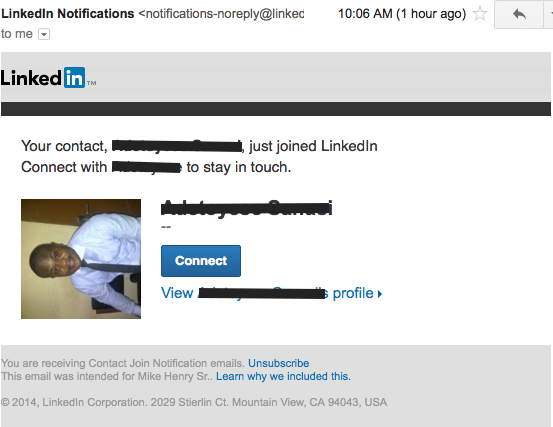 Why would someone (LinkedIn or otherwise) send me this if every link in it does, in fact, go back to LinkedIn? Does LinkedIn really have some great reason why I should connect with this person? Where did LinkedIn get the idea that this person is a contact of mine? They’re not in my LinkedIn contacts or in any of my email in any of my systems. This is actually the 2nd one of these I’ve received. I sent a request to LinkedIn both times for help. This time I also posted on their support forum and I’ve commented on some other threads on their support forums. too. Last time, about a month ago, I received no response. I can only hope someone graduated from high-school hoping to be the answer to these types of issues rather than settling for taking part in the cause. Now to my real question: Where have we settled on being something less than our best dream or our ideal future? What can we do about it?